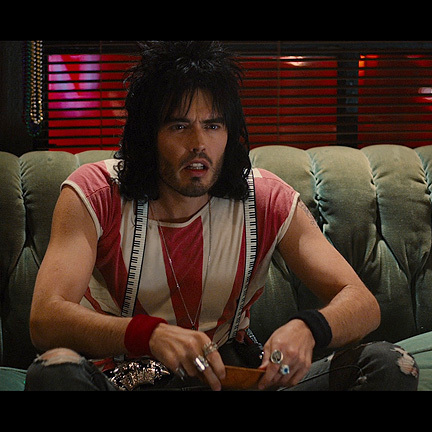 This costume was worn by the character “Lonny” played by actor Russell Brand in the 2012 film “Rock of Ages” as well as “Dirk Diggler” portrayed by actor Mark Wahlberg in the 1997 film “Boogie Nights”. 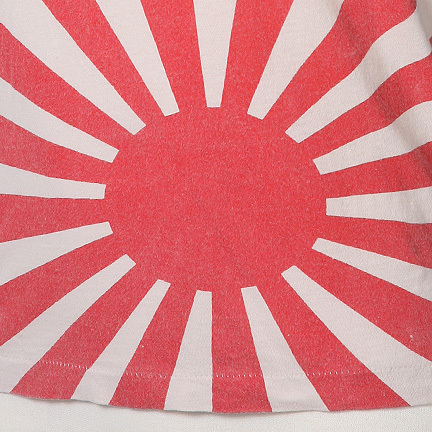 The vintage 80’s sleeveless t-shirt is constructed out of a cotton material with a red sunset pattern and black Japanese character print. 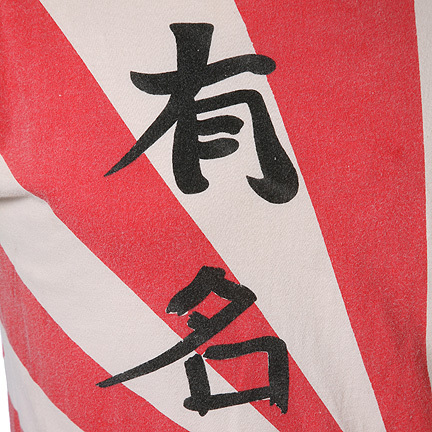 The English designer of the shirt threatened to sue the studio if they did not remove the logo in post-production. 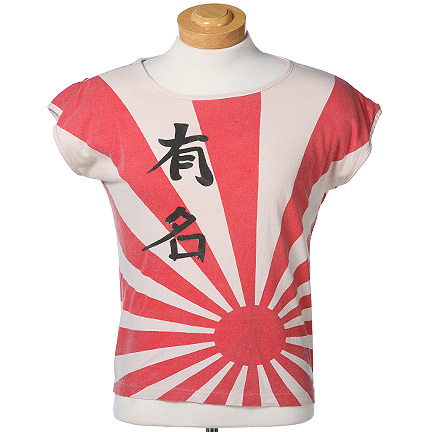 Warner Brothers digitally removed the Japanese characters from the shirt to avoid a lawsuit. Set photos with then-wife Katy Perry, reveal Mr. Brand in the shirt before it was digital altered. Mr. 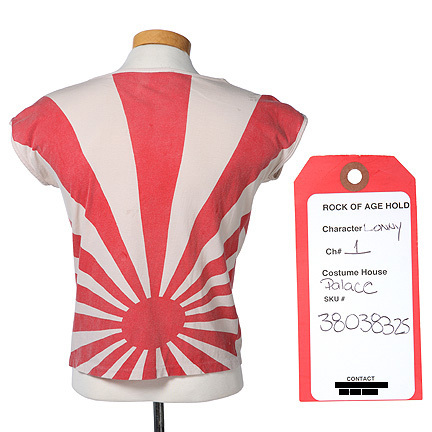 Brand can be seen wearing this shirt during the opening scenes of “Rock of Ages” while he is working at “The Bourbon Room” when he dances and sings, “Don’t need nothing but a good time.” The shirt is also seen several times in the office of Dennis (Alec Baldwin) including when together they sing, “I love Rock N Roll” into a hairbrush. 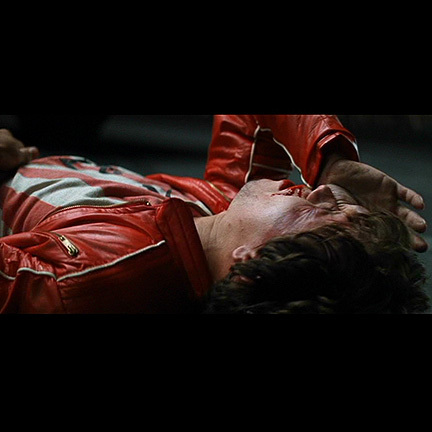 Mr. Wahlberg can be seen wearing this shirt when his character Dirk Diggler turns to male prostitution in order to support his cocaine habit. 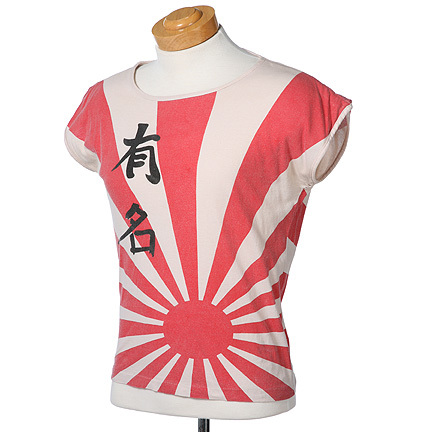 This shirt is in great screen used condition and is accompanied by a letter of authenticity from the costume house. 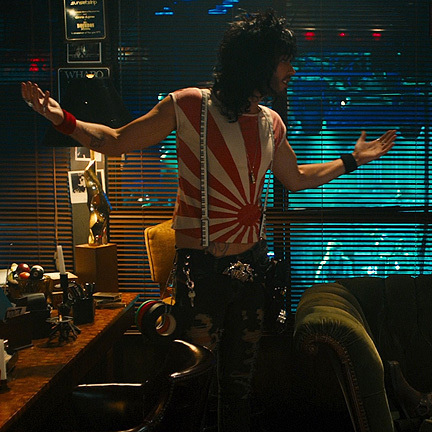 “Rock of Ages,” starring Tom Cruise, Catherine Zeta-Jones, Russell Brand, Paul Giamatti, Bryan Cranston, Alec Baldwin, Mary J. Blige, Julianna Hough, and Diego Boneta, is an adaptation of the rock jukebox Broadway musical of the same name. The film had the sixth highest opening ever for a musical, and third all-time for one adapted from a stage production. “Boogie Nights” was directed by Paul Thomas Anderson and featured an all-star cast including Burt Reynolds, Heather Graham, Julianne Moore, William H. Macy, Philip Seymour Hoffman, John C. Reilly, and Don Cheadle.